The 13th Pambansang Muziklaban Grand Finals are here again. 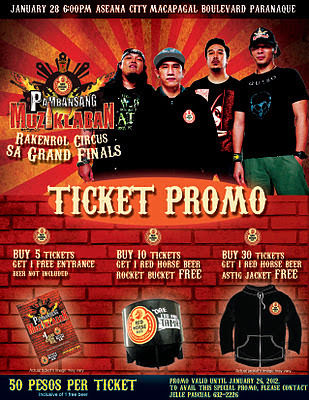 Together with the best band competing this saturday , January 28,2012 at Aseana City, Macapagal Boulevard Paranaque. of Razorback and Marc Abaya of Kjwan collaborate with the semi-finalists to test their mettle. 5. David vs. Goliath - A tribute of City Davao to Francis M.
Event is open to all, 18 years and up.